Ok, ok, I know everybody and their brother has a recipe for Peanut Butter Cookies on their blog, and they’re all pretty much the same recipe, but I want to have it here for myself. My go-to place, you know. 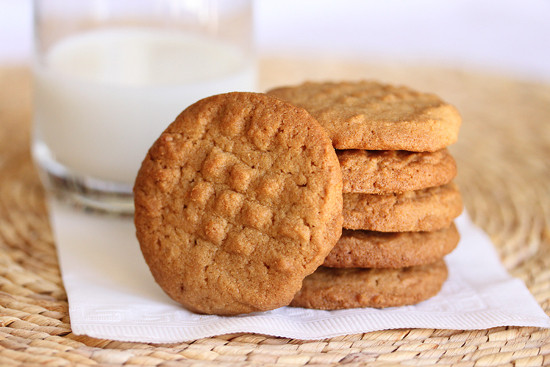 Peanut Butter Cookies are one of the four cookie recipes I brought from my childhood, along with Chocolate Chips, Snickerdoodles and Gingersnaps. We mixed them up in a big bowl with a fork and we used salted butter. This was in the 1950’s, and even though the KitchenAid stand mixer came on the market in 1919, we didn’t have one. A fork and muscle power, and we did just fine. Peanuts are native to the tropics of the Americas and were mashed to a paste by the Aztecs hundreds of years ago. J.H. Kellogg, of breakfast cereal fame, invented an early version of peanut butter which was patented in 1897. George Washington Carver is the most well known promoter of the peanut and in 1916 he compiled 105 recipes for its use. Included were 3 peanut cookie recipes using crushed or chopped peanuts. In the 1920’s peanut butter began to be listed as an ingredient in recipes, and sugar and molasses were added to it for sweetness. 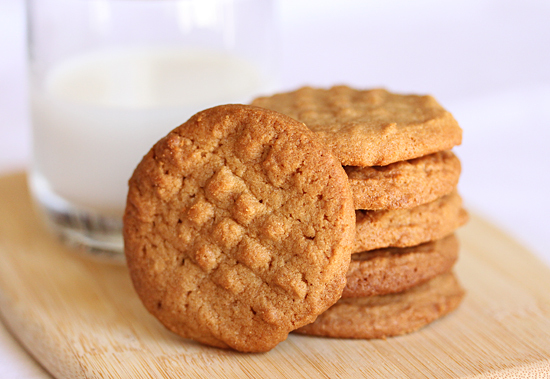 Early peanut butter cookies did not have fork marks; they were rolled and cut into shapes. The first reference to the famous criss-cross marks created with fork tines was in a Peanut Butter Cookie recipe published in the Schenectady Gazette on July 1, 1932. Pillsbury, one of the large flour producers, popularized the use of the fork in the 1930’s. The 1932 or 1933 recipes do not explain why a fork is used, though: peanut butter cookie dough is dense, and without being pressed, it will not cook evenly. Using a fork is the perfect tool, plus it makes a distinctive decoration that is instantly recognizable. And just in case you might need this information, the oil in peanut butter is known to allow chewing gum to be removed from hair. A good thing to know. Just saying. 1. Preheat oven to 375 degrees F. Line top pan with aluminum foil. 2. Cream the sugar, brown sugar and butter in a large bowl with a fork. Add the peanut butter and mix thoroughly. 3. Add the eggs, baking soda, baking powder, vanilla and salt and mix thoroughly. 4. Add the flour in three parts, mixing each addition thoroughly. 5. Using two spoons or a small ice cream scoop, form the dough into balls the size of walnuts and place them on the cookie sheet about 2 inches apart. With a fork, flatten each dough ball by making two criss-cross marks with the fork tines. 6. Bake on double panned cookie sheet for 10-12 minutes until firm and medium brown color. Remove from sheet and cool flat on paper lined surface. 7. Store at room temperature in an airtight container, or freeze. Note: This recipe can be halved if desired. I used salted butter, but if you are an unsalted butter purist, go ahead. So glad you used real butter. A lot of recipes call for that dreaded Crisco. Gag! Thanks for the peanut history. So I’ve become very interested in the history of certain favorite foods in my house, which made this post very enjoyable to read. Thank you so much for sharing with me tonight…I’m salivating for peanut butter…and thank you for all your kind words on my own blog. I appreciate you! Have a blessed week! Hi Lynne. Very nice website. I am curious as to why you are using a double pan to make these cookies. I usually use a Silpat when baking cookies. This recipe is one I will add to my “Recipes to Try file” as I love anything made with peanut butter. I am glad you decided to publish your own recipe to this cookie too because your post definitely shines in the crowd… it was great to read all the story behind a single little cookie. I have just discovered your blog thanks to Alter Gusto (another blog) and I love it! 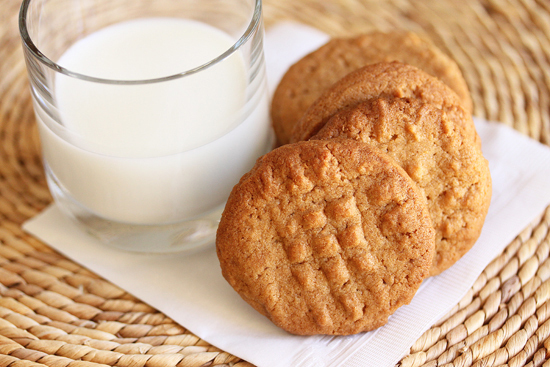 I have never baked peanut butter cookies although I have several recipes in store. I think I will try yours very soon. Thank you so much for the historical explanations: now I understand the criss-cross similarity in every recipe I have come by!